We really only made this because there was leftover blue cheese in the fridge but it’s a perfect combination of complementary flavours. Good with some purple sprouting broccoli on the side. 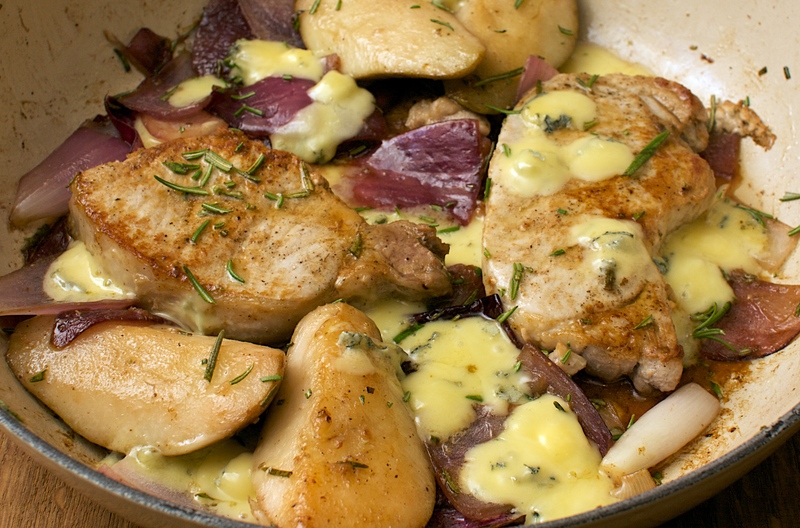 Heat the oil in a roasting tin on the hob (use 2 rings), then add the onions, pears, most of the rosemary and seasoning. Fry for 5 minutes or until just starting to caramelise. Heat the grill to high. Season the pork, then arrange among the veg and fry for 5-10 minutes, until golden and cooked through. Scatter with the leftover rosemary and the cheese, grill until the cheese melts. on 9 February 2012 at 8:42 pm | Reply Amy T.
This is the kind of dish that makes me sad I have gone vegetarian. Sounds amazing.